While problems related to the root and pulp of your tooth can only be diagnosed by a dentist, there are some symptoms you should look out for. 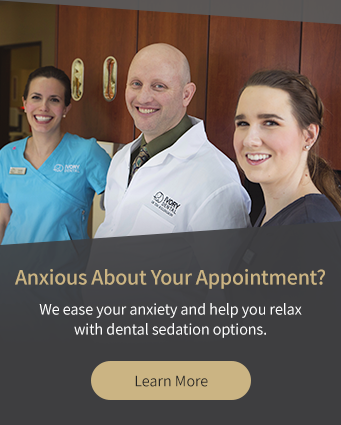 Here, our Lethbridge dentists outline three signs that you may need a root canal. The root canal is made up of the inner passages of a tooth that connect the pulp to the roots. A root canal procedure is a dental treatment in which infected tooth pulp material is removed from the interior of the tooth to prevent pain and preserve the tooth. An infection of the tooth pulp is often characterized by pain in the tooth. You may notice sharp pain while you are chewing or otherwise applying pressure to the tooth. You may also experience severe sensitivity to hot or cold temperatures. If you are experiencing pain in your tooth, make an appointment with your Lethbridge dentists at Ivory Dental as soon as possible for a positive diagnosis. You may notice a small, pimple like bump forming on the gums near a tooth that might need a root canal. This is called a dental cyst. Dental cysts form around the roots decayed or infected teeth, and sometimes form if the pulp of a tooth is infected. A tooth with infected pulp may become dark in colour, or even black, due to the internal damage. If you notice that one of your teeth has become darker than the others, it may be indicative of a problem with the inner pulp. If you are experiencing any of the above symptoms, contact our Lethbridge dentists for an assessment and diagnosis.